anakpanyu......slowly walking towards the finish line: 85K Completed!!! Once again, I've completed another enduring challenge. 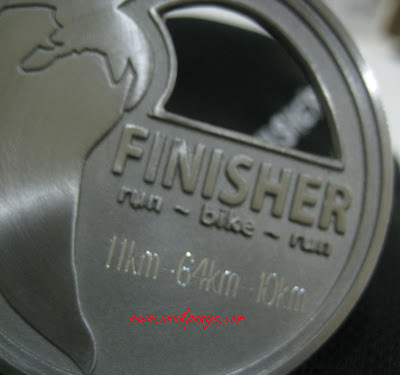 A total of 85km - 11km run, 64km bike and another 10km run to complete the whole challenge and must be completed within 5 hours. I've 50 mins to spare (4:10:00). Arriving at the KLIA airport on Thursday, 6th November around 2pm. Our transportation was ready and greeted by the Powerman committee. 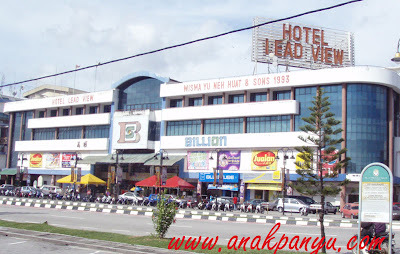 It took more than 3 hours to reach to our Hotel at Sri Manjung, Lumut Perak. From KLIA, we asked the driver to take a detour to the bicycle shops in Petaling Jaya - BikePro and KSH. Luckily no additional charges for the detour. They charge us RM600 per trip (3 persons + 3 bicycles). Expensive!!! We arrived at our hotel around 7pm. According to the Concierge, we were the first hotel guests to arrive for the Powerman event. I guess we were to early. 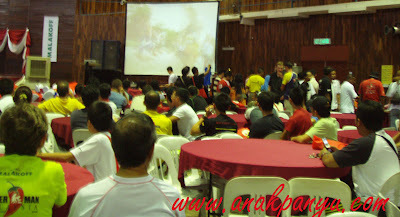 Other athlete especially the Elite have arrived since last week and they are staying at the resorts near Lumut. We checked in our rooms - 2 connecting rooms. Unpacked our bicycles. Luckily my bicycle didn't have any problem but the other 2 bicycles have gearing /tuning problems - a minor problems which was solved. 2nd day, Friday, 7th November 2008. Test ride the bicycles to check for problems and to locate the starting venue. We brought along our Team Anakpanyu Jerseys. We arrived at the mini stadium where the event will be held. We were then approached by one of the local and asked us if we want a tour of the race route. He introduced us to the young local kids who was there training and asked them to show us the race route. According to them, they have been helping the overseas athlete for the past few days showing the race route. The race route for the run was totally flat - 5.5km x 2 loops. The bike route was 90% flat with 3 bridges to cross/climbed. The picture above is the highest bridge - almost the same bridge in Sg Teraban after the tol. We have to climb the bridge 4 times. Luckily, we trained for it - Bukit Mentiri. The top of the bridge before accelerating down. I managed to reach maximum speed 55km/hr. I guess some of the riders managed to get 60 to 70km/hr. Saturday, 8th November - Briefing day and collection of goodie bag. The collection of goodie bag open from 12pm to 5:30pm and the briefing started afterwards. 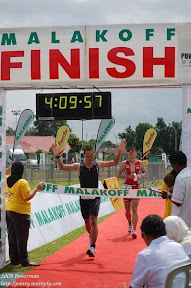 We came around 4pm, we collected our BIB numbers, timing chip with RM50 deposits, free t-shirts. There were a lot of sporting equipments being sold at a cheaper price. I've bought a lot of Powerbar products. 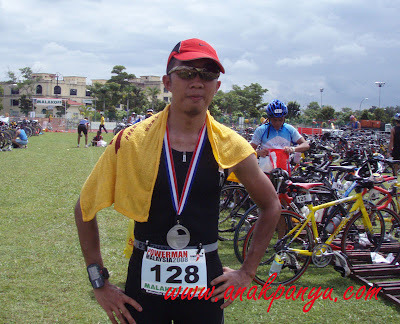 If I have enought money, I would have bought another triathlon 2 piece suit. The first run of 11km (5.5km x 2 loops), I've managed to complete it in 56:39 mins. Zaeidi did it better in 54:58 mins. My running on that day was not good. I should have done better. 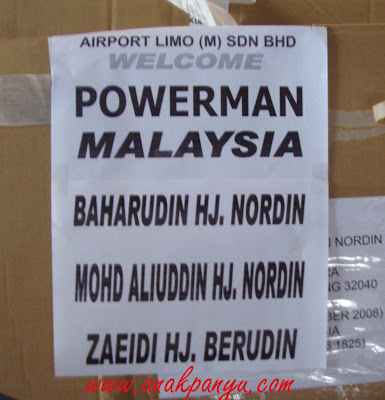 Tidak ada power. It seems that my leg doesn't want to run any faster than that. 64km cycle - I have no problem with the cycling event as we have a lot of training for it compared to running. The first few kilometers I've managed to 'sayur' a lot of cyclists. I guess there were still in cruising mode or recovery ride after the run. As a results of that, I got a cramped on both of my legs. From past experience, you don't stop pedalling. Change your gear to easy - high cadence so that the muscles is relaxed. So my speed drop from 35 to 27. After a few minutes, I've recovered and once again aku potong a few cyclists. Some managed to 'sayur' me back. Drafting is illegal and if you get caught you'll be DQ (both the drafter & draftee) after the 3rd warning but I saw a lot of cyclists doing it. There are even a group of cyclists going from one end to the other end drafting. If they saw the marshals, they break up, then they re-group again. I guess they didn't attend the briefing or read the booklet instruction. This is what I called 'taipau' . 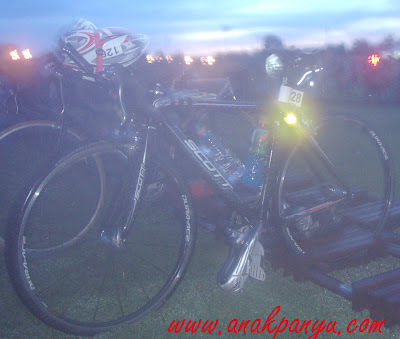 tunjuk kuat arah non-drafting race. Show your leg power by doing 'one man gang' style. The long steep bridge was not a problem to me. I 've managed to climb the bridge without changing to a smaller cranks and managed to sayur a few on the way up. I've managed to complete the cycling in 2:01:49 hours. Below the target of sub 2 hours. The finisher medal with Powerbar wet towels. It was a good results but I'm a bit dissapointed. I should have done better in my running. I guess that day was not a good day for my running. There was no power. Well, there will always be next year. We will come back again and hopefully one of us will break sub 4 hours. Lastly, On behalf of my brother & nephew, we would like to say thank you to the organiser, the local people of Sri Manjung for showing us around the race route, the local athletes - thank you very much for the support & encouragement eventhough sama sama nda tau nama. Zulhassan - next year bulih 'sayur' aku balik, itupun kalau aku ikut lagi. Missjewelz - next year aku cuba 'sayur' ko pulak. Harap harap kitani jumpa arah neutral ground - Singapore, Thailand, China or etc. Korang jugak di jemput ke Brunei, bulih test power di sini, atupun kalau ada race yang besar besaran, selalunya acara kecil kecilan. I'm officially now a Powerman!!! 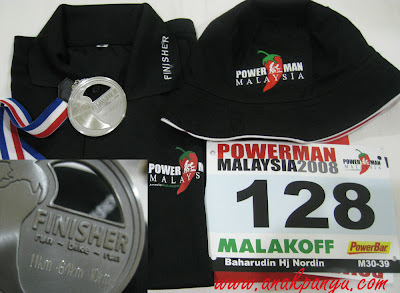 ultra power ironman hahahhah..... memang power ranjer lah korang ni .